Loan modifications under a federal plan announced by President Obama had hope for homeowners who were struggling to make their mortgage payments, and for those who were already in default and facing a foreclosure. 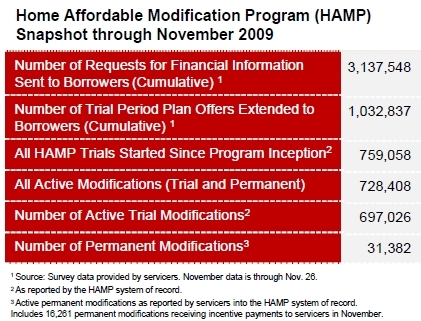 Over 3,137,548 homeowners made requests for information, but only 31,382 actually got permanent loan modifications. Mortgage representatives around the country geared up to help homeowners save their homes and many implemented special educational programs to get the word out. Unfortunately, it now appears that the program has been a dismal failure with only a one percent (1.0%) success rate. While one could be critical of the Obama program for the failure, the real victims are homeowners across America. 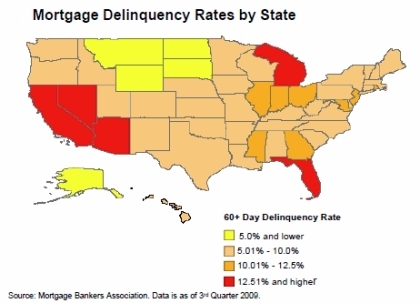 The pace of foreclosures in several large metropolitan areas has not slowed down. For the government’s report, see Loan Modifications Report. “So out of over 3 million requests sent to borrowers, only 31,382 modifications have been made permanent. That’s a failure of epic proportions. Imagine if you got a 1% score on a test when you were in school. How embarrassing. No wonder the link to this report is “accidentally” broken on the financial stability website. (I found it by guessing what they’d correctly name the file and typing it into the browser. )” Quoted from the Atlantic, 1% Success Rate. 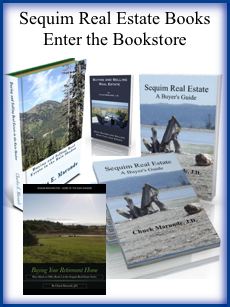 There have been some successful loan modifications in Sequim and Port Angeles, although not necessarily under the federal program. Clallam County has seen its share of foreclosures gradually increasing. Trustee’s Sales at the Courthouse have stepped up, and projections are that there are many coming down the pipeline. We shall see, but if you are in need of a loan modification, pursue that diligently with a reputable loan rep. Many have gone down the path of modification with a rep that dragged them along for months with nothing in the end, and all that after paying a hefty fee. The Obama administration’s housing plan will offer two types of assistance that are designed to help make mortgages more affordable for up to 9 million homeowners. The plan includes two parts: refinancing and loan modifications. Refinancing. Homeowners with more than 20 percent equity in their home can easily refinance their mortgage at today’s low rates and decrease their monthly payment by hundreds of dollars. But people whose home values have dropped significantly will have a tough time finding a lender that will refinance their mortgage. This refinancing program will help those people refinance. To qualify, your loan must be owned or guaranteed by Fannie Mae or Freddie Mac, and you must not have missed any loan payments in the past 12 months. The deadline for refinancing under this program is in June 2010. Chances are your loan is owned or guaranteed by Fannie Mae or Freddie Mac even if you send your monthly payments to a mortgage servicer. Ask your loan servicer whether Fannie or Freddie owns your loan, or look up your loan in the Freddie and Fannie databases at http://MakingHomeAffordable.gov. Loan-Modification. This program is designed to help people who are struggling to make their current mortgage payments. The government will provide incentives for lenders to lower your monthly mortgage payments to 31 percent of your gross monthly income, either by lowering the interest rate to as little as 2 percent or by extending the terms of the loan up to 40 years. To qualify, the loan must have originated on or before Jan. 1, 2009, the principal balance cannot exceed $729,750, and the home must be a primary residence. Borrowers also have to document income and sign an affidavit of financial hardship., and the modification must take place by Dec. 31, 2012. You can reduce your monthly payment with a loan modification. Many people are successfully getting the loan on their home or business modified right now, and you might want to be proactive and get this process started. Watch this short video for help, and if you want an expert mortgage loan mod guy, email me and I’ll pass on his name and contact information. Don’t think anyone can do this. It is definitely a niche expertise right now. It’s not for just any loan rep to to learn at your expense. Be proactive if you are facing high debt service and could end up with a foreclosure action in the coming months. If you wait to sell your home or your business at the 11th hour before a Trustee’s Sale, you may lose everything. If you find a buyer just before a foreclosure, you may be at the buyer’s mercy on the price. Don’t wait until it is too late. Be proactive with a loan modification now. How does a loan modification work? A loan modification is not a new loan, it’s not a refinance. It is the same loan with adjustments to the terms of the loan so that you can reduce monthly payments. That is done with an adjustment to the interest rate or to the amortization schedule, or both. Many people have told me they called their bank and tried to get a reduction in the monthly mortgage payment but it didn’t work. There’s a simple reason they could not get that done. The process of applying for a loan modification is very detailed, requires a ream of paper and information, and there must be a very persuasive argument as to why the modification should be allowed. You have to know who to contact, and most local bank tellers don’t even know who you would contact for their own institution. Loss mitigation departments or the modification division of any mortgage company is not found locally. They are not listed in the phone book. They are not listed on the Internet. These departments are not trying to hide from you, but they were not created to interface with the public, so they are below the radar. In order to put together the right paperwork, you must know what they want, and to make persuasive arguments in writing, you must know what the issues are and how to address them. 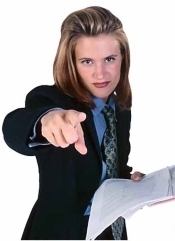 Then you must be able to write very good English and be very persuasive. The truth is very few homeowners or business owners will have the knowledge and experience to get this done right. For those who try and screw it up, it could ruin their chances entirely even if they do hire a professional later. I am not a loan modification guy. I do know one who is, and he is one in a thousand who knows how to do this. He is having great success with loan modifications. 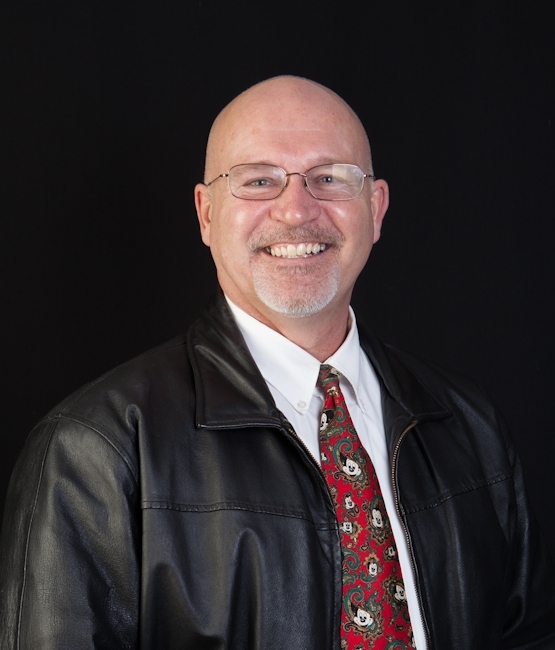 He tells me incredible stories of good people who are staying in their homes because he was able to help them get a substantially reduced monthly payment. What an incredible service he offers! 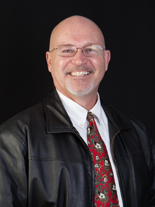 If you do need help getting your monthly payments adjusted with a loan modification, email Chuck Marunde. I’ll refer you to a man who can help you get the job done. By the way, he is qualified to do this in any state, so it does not matter where you live. Don’t wait until it is too late. Be proactive and start working on your loan modification right now.